This conference will bring together scholars, activists and politicians from both Europe and the United States for a comparative examination of the effects of immigration policies in the United States and Europe. 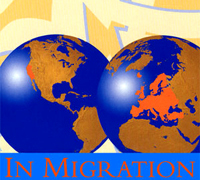 Migration issues will be addressed not only from the perspective of the industrialized nations of Europe and North America, but also from the point of view of “Third World” nations enmeshed in this global problematic. California is uniquely situated to address migration issues and could become a testing ground for designing and implementing innovative policy solutions. "Lessons from the Politics of Immigration in California"